Imagine a career with an organization that has brought smiles to thousands for 80 years. Imagine working with people whose passion for what they do is surrounded by love and romance. 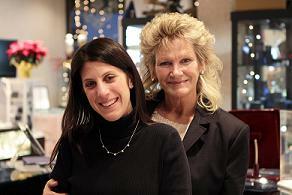 Orin Jewelers is not only rich in tradition and heritage, we are family. With our vast array of both businesses and professionals, you’ll have the opportunity to join a team that’s second to none. We invite you to discover for yourself why a career at Orin's is the opportunity you‘ve been looking for! We are currently seeking individuals with high energy, enthusiasm and a love for jewelry and gems. Experience in the world of jewelry is a plus, but if not, we will combine your natural talents and guide you to be successful and grow into a fun and rewarding career. Every day would provide new and interesting challenges, and an opportunity to help customers make some of the most rewarding buying decisions of their lives. We prefer that you apply with resume in person, however if you would like more information regarding joining the Orin Jewelers family, please contact Matthew Tatro at our Garden City Showroom at (734) 422-7030, or Greg Gilbertson at our Northville Showroom at (248) 349-6940, or you may request more information on our contact page. We look forward to meeting you!